Battle Creek, MI – Operation Rescue has released the name of the woman who was found dead just days after an abortion on July 4, 2016. The woman’s identity was discovered by long-time Michigan pro-life activist Lynn Mills. Cree Erwin, 24, was the mother of a one-year old boy. Sadly, Ms. Erwin passed away in the early morning hours of her son’s first birthday. 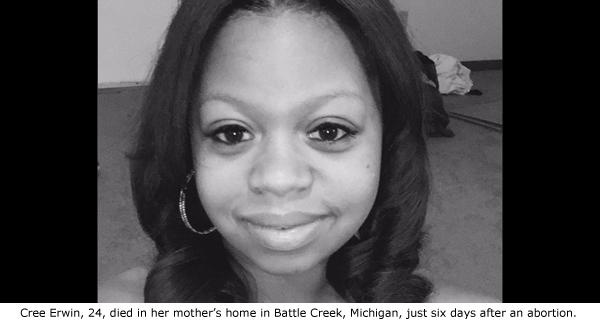 She was found dead in her mother’s bed in Battle Creek, Michigan, where she grew up. Operation Rescue extends its deepest condolences to the Ms. Erwin’s family, who was said to be “devastated” at news of their loved one’s passing. Ms. Erwin also appeared to have attended a local protestant church. Operation Rescue was able to confirm the address where Ms. Erwin passed away, which was within blocks of Bronson Battle Creek Hospital where she had gone on July 2 for help while suffering with severe “stomach pain” four days after an abortion. Social media comments posted to the initial WWMT.com story on Facebook.com about Ms. Erwin’s death also reflected patient care issues at the hospital where Ms. Erwin was treated and released two days prior to her death. An autopsy has been conducted but the Medical Examiner’s office has not yet released an official cause of death, but given the complications Ms. Erwin suffered from her abortion, it is very likely that contributed to her death. While it remains unknown where Ms. Erwin received her abortion, the closest abortion facility to Battle Creek is the Kalamazoo Health Center Planned Parenthood, which has a history of medical emergencies, the most recent of which took place on September 10, 2015. Michigan Right to Life has informed Operation Rescue that it was able to confirm with relative certainty that the abortionist on duty at the Kalamazoo Planned Parenthood on Tuesday, June 28, when Ms. Erwin is said to have had her abortion, was Mandy Gittler. Gittler was involved in another patient death while working at a Chicago Planned Parenthood abortion facility in 2012. Gittler conducted a second-trimester abortion on Reaves, during which she punctured Reaves uterus. Gittler delayed calling for medical assistance for 5 ½ hours while Reaves suffered internal bleeding. “If it turns out Gittler was involved in Ms. Erwin’s death, Planned Parenthood has a lot to answer for,” said Newman.